Died today. I am heartbroken. I wish I would have had a camera with me at the exact moment that the booger machine at the Arizona Science Center sneezed and the booger hit Jackson in the face. It is a machine that you throw these foam balls, "boogers", into a nose, trying to make it past the nose hairs, and it randomly sneezes. I was making sure that my other child didn't run off into oblivion, so I wasn't able to read the purpose of the exhibit, maybe so kids know to cover their nose and mouth when they sneeze! Anyway, Jackson was having a blast just throwing the balls in, when suddenly it sneezed, and you see him jump a mile. These tourist looking people totally saw the whole thing, and they were dying. Jackson thought it was great and wanted to do it again and again. Although nothing can ever compare to the first time! They actually count your items at COSTCO! How many times have you stood in the line to exit COSTCO wondering what they are actually looking for, and wondering if they ever find it? WELL, today ladies and gentlemen, they found what they are looking for! It was not busy, it was relatively slow, so the lady starts counting, and re-counting, and COUNTING AGAIN, trying to figure out what they missed because the amount of items sold is one less than the number of items in my cart. Needless to say, I didn't have a ton of stuff, but I didn't have like one or two items, my receipt was for over a hundred dollars, and I was thinking, if they make me go back with my two children in tow to pay for this milk, I AM GOING TO FREAK! The lady was like, stand here for an audit, they will come to you! So, there I am standing like some criminal at the exit door of COSTCO, where everyone was staring at my two children and I, waiting for the manager to come. Here is where it gets good because the line is starting to grow behind me, the counter lady goes up to all there carts, GLANCES over each cart and swipes her pen down the receipt. There's your clue, if you want to swipe something from COSTCO, make sure you go through the end line when it is REALLY BUSY because they do not check as thoroughly. The manager finally makes it, I hand her money (I only had cash because I ran it as debit so that we could eat lunch before leaving-I know some of you are shocked, but I do know which places accept cash only-ESPECIALLY WHEN IT COMES TO FOOD) because I figure she is going to run back over to the register and ring up my milk, but nope, she gives me the milk for FREE! Who would have thought that two gallons of whole milk would be OH SO EXCITING, but when you are in the market for a cow, it makes for an enjoyable day! Now we are home, thinking about swimming later and wondering if it will ever cool down. It is almost too hot to swim because we have to walk to the community pool because ours is still being treated, and by the time we get over there, I have a headache that is directly related to the SUN! On a side note, I am just so sad that Estelle Getty, Sophia from Golden Girls, died today! May she rest in peace and live on in television reruns for years and years to come! I just read that The Dark Knight is only rated PG-13, it is DEFINITELY R!!!!! I just had to post about all the shoes that we got around here this weekend. Well, not the adults, but the kids. As many of you know, Tyler has what some like to call a SHOE FETISH!!!! So, she is absolutely beside herself with all the purchases! 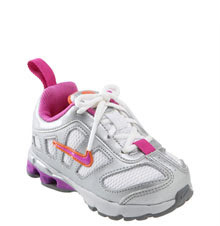 She was not such a fan of athletic shoes, but once Jackson told her that she could run in them, AND she realized that she got to wear socks like Jackson, she was sold. We got 8 pair of shoes here at the homestead for LESS than $80!!! Below are some pictures of the shoes that we got! 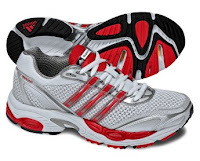 The Adidas shoes, we got with orange, but I couldn't find a picture of those, and I was too lazy to find my camera! 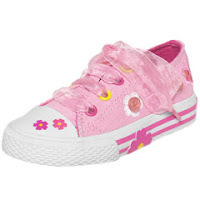 We also got a pair of hot pink and orange Mary Janes, but they only had a picture of the blue version online, so you will have to wait until she wears them with an outfit, and you can catch them in a picture! Also included are two pair of flip flops for Jackson! I LOVE SALES! I also broke down and went to see a movie this weekend, and not a movie you would expect me to sit through, but I did it out of the kindness of my heart, and I went to see The Dark Knight! AND NOW I REMEMBER WHY I DON'T SEE THOSE MOVIES!!!!!!!!!!! Seriously, the scariest movie I have seen in a really long time. 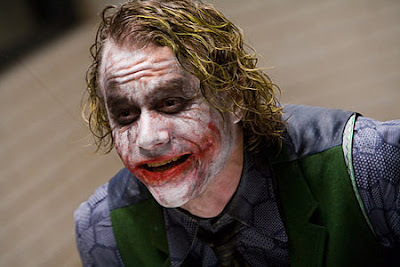 I think it would have been less disturbing had Heath Ledger not died shortly after filming it, but he was so disturbingly GOOD at playing his role, that I was scared out of my mind the whole time, went pee TWICE, just to escape the insanity, and then there was the whole helicopter crash scene which just about set me over the edge. I spent a good majority of the movie looking away and hoping that it was coming to a rapid end, but it is a two and a half hour movie, so my trauma was not short lived! All in all, Ledger deserves every award that he wins for this movie AND MORE! I love them BUT. . . It has totally been that kind of afternoon. Jackson whacked Tyler in the head with the Wiggles flashlight, then she fell and hit her head, then nobody ate the dinner I made, Tyler cried hysterically because I wouldn't give her any milk until she ate something, she is on a liquid diet, and I think she needs some FOOD (it was macaroni and cheese, not even vegetables), refused to eat, so I put her to bed, and I come out and Jackson is repeating that he wants fruit snacks over and over again, but he didn't eat dinner, so then he starts crying, and it is just a bunch of craziness here. He is headed to bed as well. Needless to say, Pat is working late, I am going crazy, and Jackson just told me that I am driving him nuts, GREAT! Time for him to go to bed, and it is only 6:14pm! Tomorrow morning is going to come REALLY EARLY!! Seriously, I feel like this may be the longest, hottest summer of my LIFE!!! It may be that it is another year gone and my kids are freaking heavier than ever and taking them in and out of the car twelve times a day is just exhausting. One would think that I would be shedding pounds at a rapid pace since I lift at least 70 pounds of "stuff" in and out of the car each time we get in and out, but I just love food too much! Pat and I went with friends to the "Best Pizza Joint in the US", Pizzeria Bianco, last night, and I was SOOOOOOOOOOOO disappointed! It had A LOT to live up to after my new favorite hang out, Cibo, and it was not even close! We had an amazing time with friends, and I have to say that I will probably NEVER forget our experience there, and I will look on the building fondly, BUT I would never wait two hours for the soggy, not so yummy pizza! Anyway, tomorrow is Jackson's last day of swim lessons. I am still trying to scam one of the teachers into coming to our home to do private lessons. We will see how it works out, but he has improved leaps and bounds in just 8 days. Already working on the backstroke, I think it may be possible for him to be an Olympic swimmer one day! 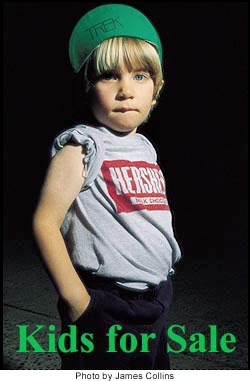 However, with the arm on this kid, we could have the next NFL Quarterback on our hands. Tyler, OF COURSE, is his number one fan! Cheering each time he dives in and waiting desperately to hand him his towel when he gets out of the pool. She is such a sweet, sweet child out in public, if only she were that sweet at home!!! Her vocabulary is expanding DAILY, and I think we are up to three words that she will put together. Phrases like, "Here you go!" and "Diaper change" melt my heart because I was a little worried about her speech for awhile. 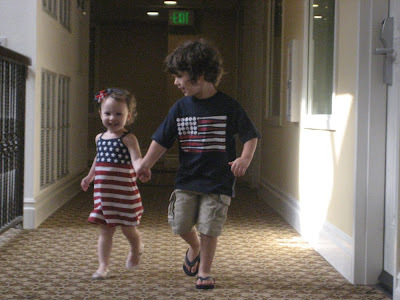 When your first child is as social as Jackson, it makes you nervous to not hear so much! She could still win any sort of staring competition that I entered her in. Strangers talk to her, and she just STARES THEM DOWN, but give her some fruit snacks or cookies, and you are hers! LOVE, LOVE, LOVE the names!!! Original, but not a fruit, vegetable or character trait!!! I know Knox may be out there, but it is like Kingston to me, they are rocker, celebrities, etc. THEY CAN PULL OF STRONG NAMES, not weird!!! 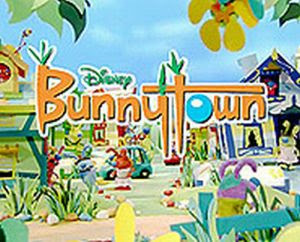 I am sure if you have kids under 5, you have had a chance to check out the "new" show Bunnytown on in the mornings, and I have to admit, I LOVE IT!!! When I hear the theme song start up, I am thrilled!! The songs are sooooooo dang catchy, and the girl who should be sooooooooo annoying with her, "Oh Me Oh My, Oh Me Oh My! ", is actually quite darling. I think I am going to research whether or not there is a Bunnytown Soundtrack, I would actually enjoy listening to that in the car! 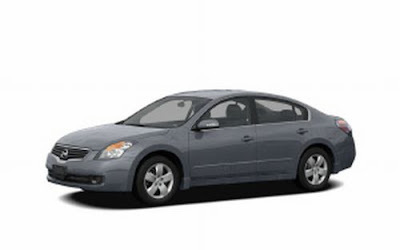 This is the best picture I could find of Pat's new car. I would go outside and take a picture, but it is pouring, so for now, this will have to do!! He is very excited about the push button start, such a MAN! I am excited to announce that we will be welcoming another little girl into our lives this fall/winter. Katie and Paul are having a baby girl. Congratulations guys, let the divaness begin! Jackson just can't escape the pink cloud that follows him everywhere he goes! One day he will thank us all! Is it too early to get my hopes up???? 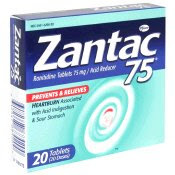 Jackson's Zantac prescription was cut in half, and I just implemented the new half pill dosage starting on Sunday, and so far so good. It brings tears to my eyes thinking that there may be a light at the end of this very long and dark tunnel. I don't think I have ever made it four days on half of a pill with no gagging or throw up, but for some reason, now that I need the information, my memory is failing me COMPLETELY! Keep your fingers crossed that he can tolerate the lower dose. I would like to thank the academy. . .
OMG! Seriously, when celebrities give birth, they should not be able to name them. Keith Urban and Nicole Kidman, along with their daughter, SUNDAY. make my list of names I hate!!!! I have to admit now that Honor is growing on me! I am just ITCHING to hear the names that Angelina and Brad give their twins! Our weekend started early Thursday morning at Matt's Big Breakfast! I now know why it is named Best Breakfast in Phoenix time and time again. The owner's wife is amazing, her sons are incredible and the food speaks for itself. A charming LITTLE place in downtown Phoenix, it wasn't exactly set up for our party of EIGHT, but they accomodated us to the best of their ability. Welcomed the kids, got our food out quickly, and overall, I will be returning, despite the price of gas and the drive that it entails to get there. Maybe Jackson, Tyler and I will go there one weekday for breakfast! Off to Palm Springs, actually La Quinta, this adorable, quaint town outside of Palm Springs. We checked into the Embassy Suites, which as a parent, I have to say is the most amazing deal! Made to order breakfast every morning, happy hour every night, a gift for the kids at check in, etc. Our breakfast at Matt's was $40 and EVERY MORNING we were in PS, we got FREE breakfast. The hotel was absolutely silent, and at four stories, Jackson and Tyler could ride up and down the elevator and wave at us as we sat in the middle of the indoor courtyard. Grandma was a trooper and would run with them around each and every floor. Needless to say after the running and swimming, the kids were absolutely exhausted and slept like gems every night! 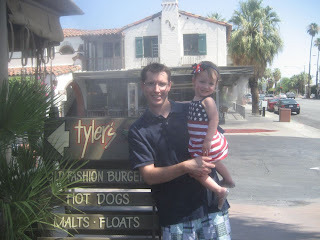 Friday we headed off to downtown Palm Springs! We didn't have any main goal there, EXCEPT we wanted to eat at Tyler's Hamburgers! It is probably hotter in PS than it is in Phoenix, and I have to say that we sat on the patio in order to enjoy this well-known establishment. IT WAS NOT A DISAPPOINTMENT! The hamburgers were amazing, the service outstanding, and I want to go back TIME AND TIME AGAIN! My cheeseburger was perfectly dressed with mayo, mustard, bacon, and pickles. YUM! The meat tasted like premium beef, and I enjoyed each and every bite! Our little firecracker, Tyler, didn't really like the hamburger, but they sure make a tasty hot dog that she gobbled right on up! We made some great progress with Tyler's swimming this weekend. 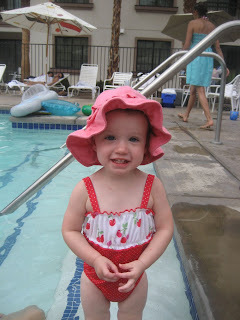 She was a daredevil in the pool, attempting to step down where she couldn't even stand above water, she went out with Katie and kicked her feet, smiling the whole time. Jackson was right at home kicking, swimming, doing "tricks", telling us to stand further and further away while he ran to us and jumped in or swam using "big arms"! The fact that she is smiling in the water, AMAZES ME!!! The rest of the weekend we chilled out, ate at Panera TWICE, and just hung out by the pool! We all had naps, the kids slept great, it was a fantastic weekend had by all!! This week we start swim lessons, we are going to see a movie, I am going to the ballet, and we are going to work on our pool being less green. It is really green and ugly right now, but that's what happens when you leave two weekends in a row! Hope you all had a Fabulous Fourth! The past week and a half has been jam-packed with activities. We seriously never sit still in this house, and yesterday, when we did have a day home to catch up, I remembered why. My kids climb the walls if they are inside for one day, I can't imagine staying inside and doing nothing all summer, so instead we load our days with as many playdates, outings and activities that we can all handle. Last week was the last week of Summer Camp. Originally, I was going to sign Jackson up for some other camps, but when I got to thinking about it, I thought he might be too young to just be thrown in some random camps without his circle of friends. Maybe we will try it next year when he is a little more social-if that is EVEN POSSIBLE! So, from now until August 18th, the blessed day that Tyler starts school, it is just Jackson, Tyler and I from sun-up to sun-down! Pat and I had a chance to get away this weekend and enjoy a stay at Loews Ventana Canyon. An absolutely beautiful resort with phenomenal Eggs Benedict, enormous bathtubs (seriously, our entire family would have fit comfortably), great martinis, and comfy pillows. If you are ever in need of a great resort in Tucson, I highly recommend this place. Super customer service as well. On Saturday night, I desperately wanted Cheetos, but there was nothing open, so Pat called room service who was just devestated that they couldn't find any for us. I got a cup of chicken noodle soup instead, while Pat ordered some chicken fingers. When the guy arrives to deliver it, they have thrown in a free soda and upgraded my cup of soup to a bowl, all because they didn't have Cheetos! It is not like I was asking for water, I asked for a very SPECIFIC item, and their customer service went above and beyond. Today, Jackson and I had a super morning together, while Tyler played at Ms. Tamara's house. We went to IHOP where the kid chowed down on pancakes, eggs, bacon and sausage. He got to try all the different syrups, and placed his own order. One of his favorite things to do. The kid is seriously going to eat me out of house and home as he gets older. 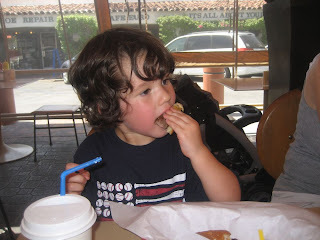 Then, he wanted to take his leftover pancakes to daddy and work, so we dropped them off. What a great job sharing! We swam for awhile, went to Target for some new pool toys and then got a "special juice" AKA Jamba Juice! Tomorrow, Sophie, Tamara's daughter is coming over so that Tamara and Ellie (her eldest) can have a special morning together.